Squirrels are like furry, little circus performers—scaling to great heights and tightrope walking right in your own yard. And while their fluffy tails and playful antics can be a joy to watch, they can also disturb your lawn and garden, rooting up bulbs, eating plants and seedlings, and digging holes. If you are game for a bit of an investment, you can buy fancy bird feeders with squirrel-proof cages around them or even weight-triggered baffles that prevent heavy animals like squirrels from getting at the seed. 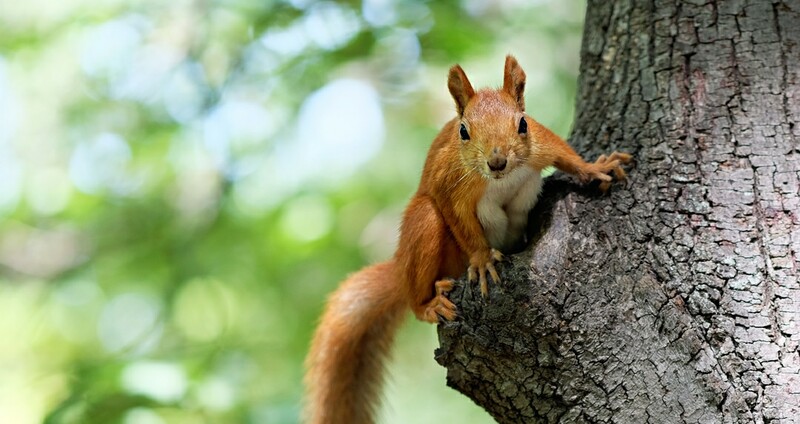 Or you can simply try hanging your bird feeder on a wire more than ten feet long, and keep it at least eight feet away from the tree trunk and limbs or any other structure from which the squirrel can leap. Another option is to fill your feeder with food that squirrels don’t like, such as safflower seed or mixes that contain hot pepper. Birds won’t notice the spice but squirrels sure will. To keep squirrels from digging up and eating your spring bulbs, lay chicken wire over the planting beds, use wire bulb cages, or stick to planting daffodils—apparently squirrels turn their furry noses up at the taste. To keep critters away from your edibles, enclose plants using cloth, plastic bird netting or chicken wire. You can also wrap individual produce such as ripening tomatoes, peppers or eggplant with bird netting. Rather than simply fending off squirrels, why not try to work with them? Set up food stations featuring goodies they love, such as raw peanuts in the shell or feed corn, in isolated areas of your yard—away from edible crops and planting beds. Be sure to include water at your squirrel station. Just a note of caution: you may attract other animals when you put out food and water.